As far as flashing lights go, the big grey D’Argento caught everyone’s attention with his booming finish to the Hobartville Stakes at Rosehill on Saturday. The Punters Intel data back up what we saw to the eye with his last 600m of 33.55 the fastest of the 1400m event. He was one of only two horses to break 34 for that sectional, the other being third placed Pierata (33.78). D’Argento reeled off an 11.26 for his final 200m and suggested he’s going to be the horse to beat when they get to the mile of the Randwick Guineas. However, we need to remember the tempo of a mile race at Randwick will likely be different so it’s worth mentioning Ace High’s performance. The Spring Champion and Victoria Derby winner ran a solid 34.34 last 600m and his splits were fairly consistent – 11.24 (600-400), 11.27 (400-200) and 11.83 (200-WP). He’s looking for more ground, naturally, and the fact his final 600m was only 0.26 seconds slower than the winner Kementari it stands him in good stead for the rest of the carnival. One more to keep an eye on deeper into the autumn will be the filly Luvaluva, her last 600m was quicker than the winner (34.03) and she clocked the third fastest last 200m of 11.56. There’s been plenty of talk about the Silver Slipper and, arguably, the data doesn’t quite back up what the eye saw in the clash between Sunlight and Estijaab. After clocking the fastest first 100m, from the 1000m to the post only one 200m split was run faster by Estijaab and that was the section between the 800m and the 600m when Neutrality put a bit of pressure on. Sunlight ran 10.76, 10.92, 10.95, 11.11 and 11.59. Estijaab ran 10.81, 10.77, 10.99, 11.25 and 11.68. Make of that what you will, when the pair clash in the Golden Slipper it’s sure to be a talking point. 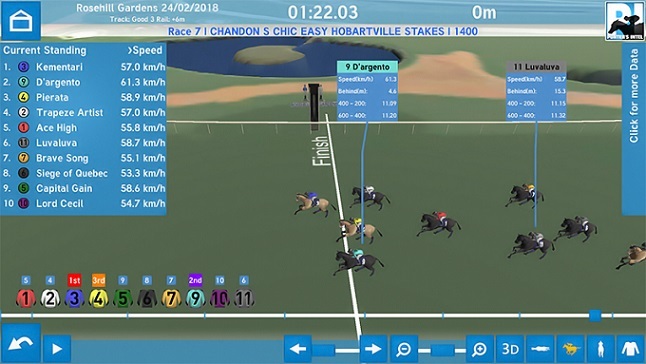 Classy mare Foxplay’s return in the Millie Fox was one that seemed perhaps just better than a pass mark on watching but the Punters Intel data shows there was a bit more merit in it. She ran 10.92 from the 400m to the 200m and her final 200m was only bettered by Heavens Above (11.34) warming up late. Foxplay also covered more ground that anything else that featured in the finish. The Goulburn Country Championships Qualifier was unsurprisingly won by a Danny Williams-trained horse but it’s worth focusing on the beaten favourite Don’t Give A Damn. Taking away the fact he was standing in the gates for an eternity, he went a fair way to setting up the track record time run by the winner Kopi Luwak. His first 200m of 12.35 was bettered only by the leader Mitali Assa Vedo then he ran a staggering 10.10 from the 1200m to the 1000m, and a 10.68 for the next 200m split. No wonder he knocked up, the three placegetters were the only horses to break 36 seconds for the last 600m. Don't miss Brad Gray and Brad Davidson looking at all the data from the weekend and ahead to Rosehill on Wednesday on Punters Intel at 7pm Tuesday on Sky Thoroughbred Central.